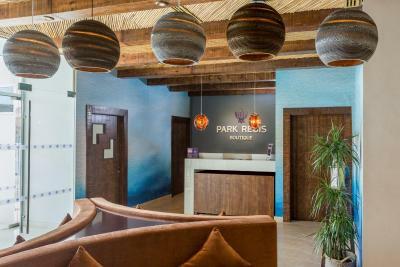 Lock in a great price for Park Regis Boutique Hotel – rated 9 by recent guests! 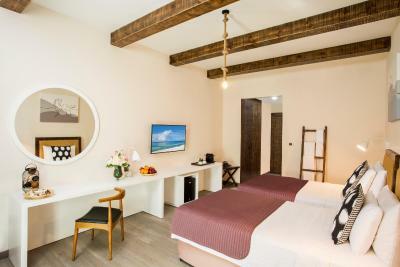 Clean cozy hotel with coffee shops and the beach nearby. The hotel is a hidden gem in the swarm of hotel in and around Dubai. It's something for a Boutique property to stand out and I must say the hotel was more than I expected. The rooms had personality, the restaurant is authentic Balkan. I was looking for something near the beach in a prime location and absolutely nothing beats the Regis for the price that I got. Do not underestimate the importance of having your hotel next to the beach, I know many hotels offer transport to the beach but having your hotel a few steps to re energize, change and head back again adds a new dimension. Being near the beach could cost you an arm and a leg but this property does it in style and without breaking the bank. Prices fluctuate due to demand so keep looking and maybe you will land the perfect package like I did. AND the Mini-bar is on-the-house can you believe that! Overall, the location is good, very close to the public beach and many restaurants. The room was spacious and staff was friendly and attentive. I really liked the furniture, design of the hotel, location, friendly staff. Hotel is clean and everything is nicely organized. Thank you for your service. Would suggest this hotel to my friends. This is the second time I've stayed here. 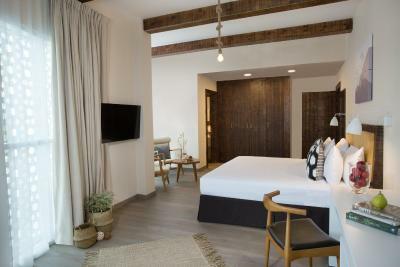 I live the decor of the rooms, modern and quirky with a bit of a beach vibe. The location is great for an evening beach walk and grabbing fresh croissants at the bakery across the road in the mornings. The contents of the fridge and snack bar are complimentary. Fabulous shower. Just wish the shampoo and soap were a bit nicer. Decent coffee in Cafe 21 in the lobby. The elevator voice is hilarious. Park Regis Boutique Hotel This rating is a reflection of how the property compares to the industry standard when it comes to price, facilities and services available. It's based on a self-evaluation by the property. Use this rating to help choose your stay! 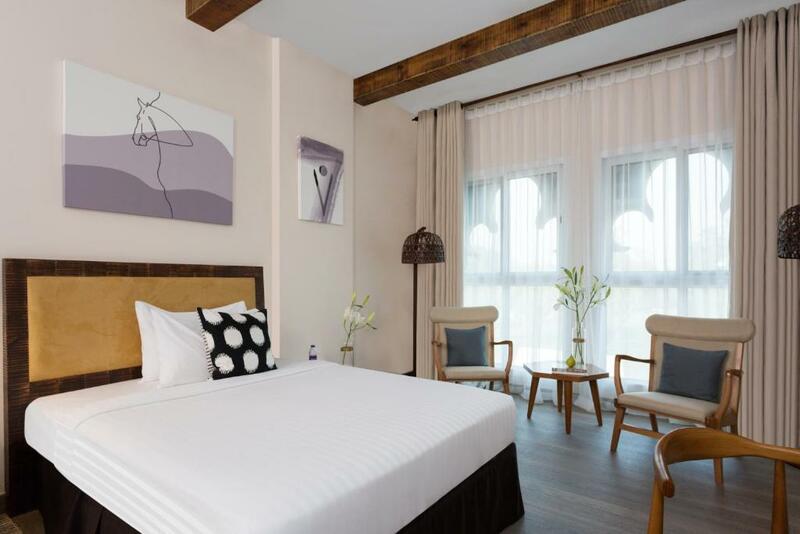 Park Regis Boutique Hotel is offering accommodations in Dubai. Located in the Umm Suqeim district, the property provides guests with a restaurant. Burj Al Arab Tower is a 16-minute walk from the hotel. All guest rooms at the hotel come with a seating area and a flat-screen TV. 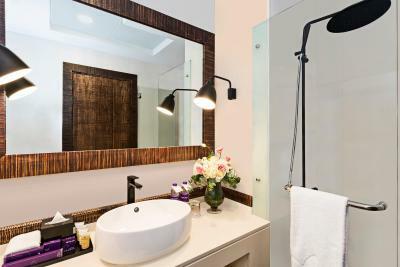 Featuring a private bathroom with a shower and free toiletries, some units at Park Regis Boutique Hotel also feature a city view. The rooms at the accommodation feature air conditioning and a desk. Speaking Arabic, English and Hindi, staff are willing to help at any time of the day at the reception. Mall of the Emirates is 3 miles from Park Regis Boutique Hotel. Dubai Airport is 16 miles away. 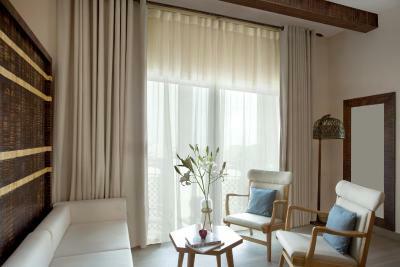 When would you like to stay at Park Regis Boutique Hotel? This double room has a electric kettle, mini-bar and tile/marble floor. This twin room has a tile/marble floor, seating area and cable TV. 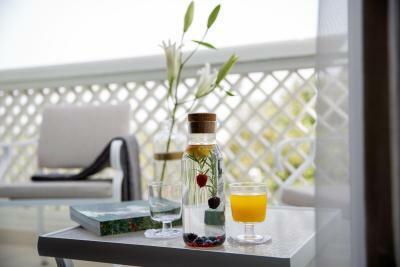 House Rules Park Regis Boutique Hotel takes special requests – add in the next step! All children under 6 years are charged AED 150 per night for extra beds. Any additional older children or adults are charged AED 200 per night for extra beds. 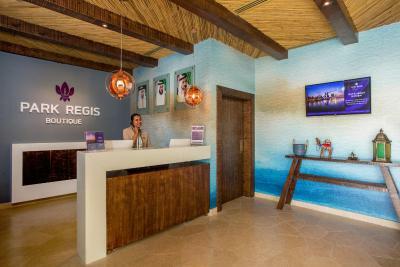 Park Regis Boutique Hotel accepts these cards and reserves the right to temporarily hold an amount prior to arrival. Parking is an issue; the area is very congested at night and during the weekend making it difficult to drive in/out and find parking. no parking for Hotel guests only public paid side road parking space. view of my room looking over next building wall. friendly staff. quite place like home with 22 rooms and one excellent restaurant. very near to jumairah public beach. 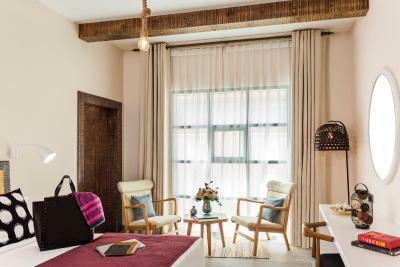 The Regis is a boutique hotel so don't expect any frills, and it's on a busy intersection so a slightly better sound insulation of the rooms is needed as a zooming ferrari could wake-you up in the middle of the night if you are light sleeper like me. The bed was hard and uncomfortable, and the pillows were not good. The hot water wasn't working in the shower for the last 2 days of our stay. The noise from the street outside was very disturbing. "Free cancellation" actually means that the money is charged in advance and then reimbursed 2 weeks later to your account if you modify the dates of your stay. Excellent facilities and location. Free coffee, tea, water, soft drinks and snacks in the room. Very friendly and professional staff. Excellent restaurant in the hotel. 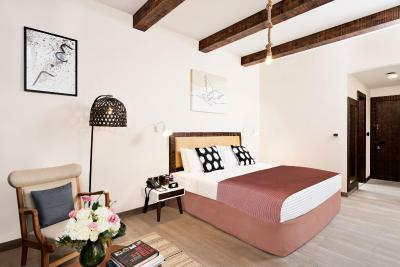 Clean, stylish and good location juts by the beach. Friendly and very helpful staff. Really great cafe downstairs. Perfect location next to the beach! Lovely staff and the room is spacious, clean and very well decorated! I would definitely recommend it to anyone! It would have been good if the hotel rent a beach parasol. It has a nice cafe downstairs and fresh beakery across the road. Beach is very close. Breakfast was marked as included in my booking from booking.com but when I arrived they said it wasn't so I would appreciate some feedback from you on this please and I will be checking the booking. I went to local supermarket and bought my own breakfast items and put them in my fridge but have I paid for breakfast I didn't have? Very comfortable room. We arrived hours before check-in time (early morning flight) but staff allowed us to check straight in. Close to beach and promenade.